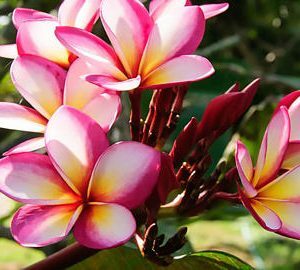 Plumerias (Frangipani) also known as the Lei flower is native to warm tropical areas of the Pacific Islands, Caribbean, South America and Mexico. 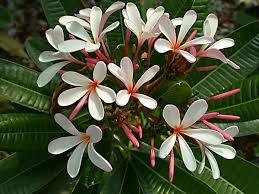 Plumerias can grow to be large shrubs or even small trees in mild areas of the U.S. 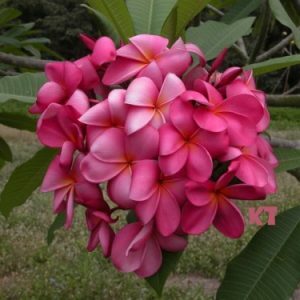 In tropical regions, plumeria may reach a height of 25′ to 35′ and half as wide. They have widely spaced thick succulent branches, round or pointed long leather, fleshy leaves in clusters near the branch tips. Sensitive to cold, leaves tend to fall in early winter since they are deciduous. In colder climates they should be grown in containers. They make beautiful potted plants for the patio or greenhouse. 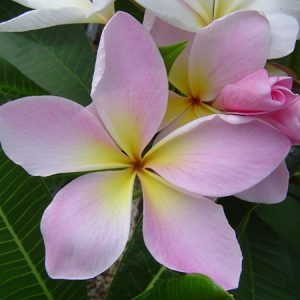 In milder climates plumeria can be grown outdoors in the ground where they may be a small beautiful landscape trees. When temperatures dip into the low 40’s they may be stored in their containers or uprooted carefully trying to take as much root as possible and stored over winter in a heated basement or garage where temperatures are kept above freezing. As soon as temperatures rise outdoors they can be brought out and planted again. They will resume growth, leaf out and begin to grow as if nothing happened. 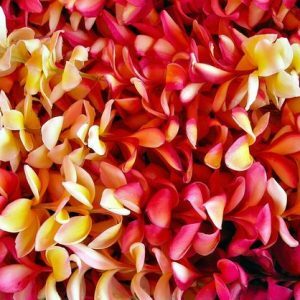 The real payoff comes during the early summer through the early fall months, when very fragrant clusters of showy, waxy flowers provide the makings for your own Hawaiian Lei. 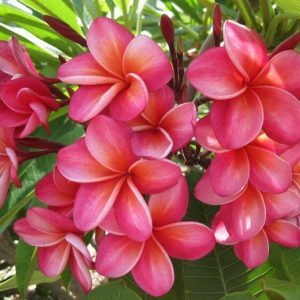 There is absolutely nothing like the sweet fragrance of plumeria in flower, with fragrances of jasmine, citrus, spices, gardenia, and other indescribable scents. 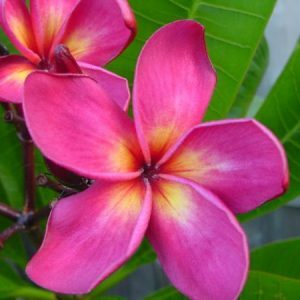 These flowers were and are treasured by the Polynesian Islanders for their durability, fragrances and colors of whites, yellows, pinks, reds, and multiple pastels. Flowering can last up to 3 months at a time producing new blooms everyday. 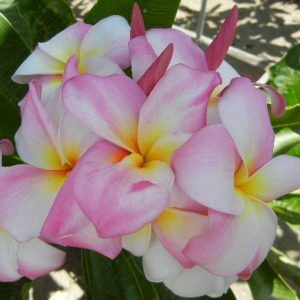 Once picked, a bloom can last for several days without wilting if kept in water. For container planting use a coarse, well draining potting soil, such as cactus mix or potting mix with perlite and sand. Start with a 1 to2 gallon container or you may consider using a large container on a plant dolly once the plant is large enough to be in a larger pot to help make the job easier moving indoors as winter approaches. Insert the cut end down into your potting mix 2 to 3″, firm soil around cutting and water thoroughly. 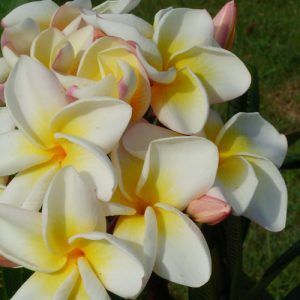 Water plumerias deeply but infrequently, let soil dry out somewhat before watering again. “Plumerias do not like wet feet”. Begin to reduce the frequency of watering in mid-October, as the cool season approaches. Stop watering after all the leaves have fallen and has gone dormant. Resume watering in the spring as new growth begins. 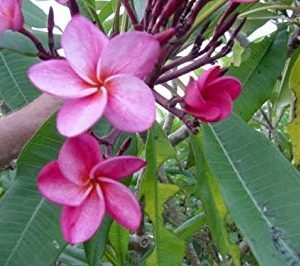 Listed is a selection of unnamed plumeria cuttings and rooted cuttings of good size, quality and ease of starting and growing. Taken from strong mature stock, these cutting tips are prone to easy flowering and have unbelievable fragrances. Cuttings range from 10″ to 16″ in length and are mature wood. Evergreen! 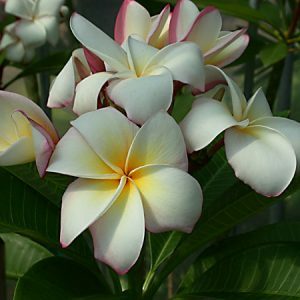 Large pure white flowers with small yellow centers, beautiful profusions of flowers on large well branched plants with shiny dark green leathery leaves. 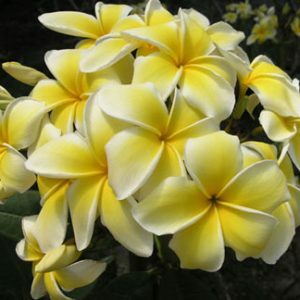 It has the ultimate plumeria fragrance of all time. Slower to produce roots from a cutting, but a very vigorous plant once established! 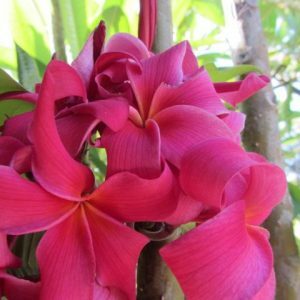 Since plumerias are tropical and so versatile, it should not stop one who lives in cold winter climates from enjoying its unforgettable fragrances and colors. 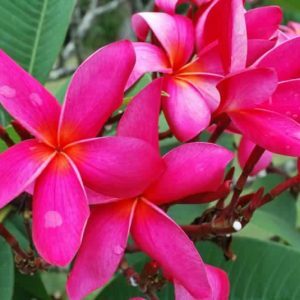 Aloha Tropicals has compiled the best of Hawaiian, registered cultivators and hybrid varieties, most reconized by the Plumeria Society of America for the one of the most premier collections in the world. Upon your order, we will specially root your cultivator with your name on it and ship as soon as it becomes rooted. Often rooted plants ordered in spring will not ship for at least 5 to 8 weeks until rooted to insure adequate success. So please be patience. However if there ready when we receive your order it will ship our sooner. The rooted plants that you will receive will be rooted in it’s own container in a soil less mix. 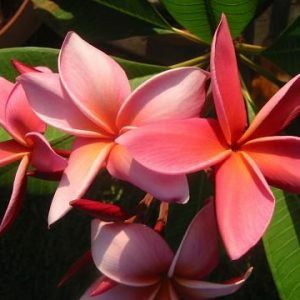 Note: Bare rooting plumerias from their growing medium sets plants back for weeks and can damage very small fine roots that are in the progress of growing and would take time for roots to mend and begin taking up necessary nutrients for optimal growth. When repotting into a larger container, gently turn container over in one hand and tap bottom to release plant and root ball. Plant in larger container or ground at same level as it was in it’s original container.